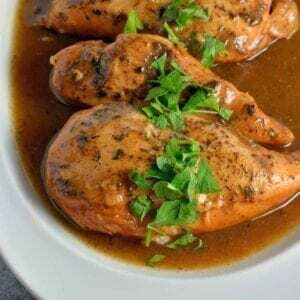 Slow Cooker Apple Balsamic Chicken is big on flavor and a bonafide crowd pleaser. Serve with buttered rice or noodles for a simple and delicious meal. In your slow cooker, whisk together apple juice through ground black pepper. Add chicken breasts, turning once to coat. At four hours, skim any fats from the top of the mixture. Melt butter in a small bowl, whisking in cornstarch. Stir into slow cooker mixture to thicken the sauce. Continue cooking on low for 30 minutes. Serve hot over rice or egg noodles. Garnish with parsley, if desired.